Gourmet Tomato Soup is a hot, savoury and nutritious healthy snack that’s easy to make. It combines the latest in nutritional science with prebiotic inulin fibre and naturally occuring tomato lycopene. Popular flavours basil and oregano offer you a taste of the Mediterranean. 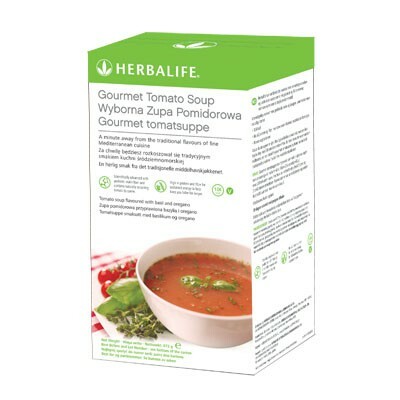 Soup is an ideal savoury snack for any weight management or healthy nutrition programme*. It is a high volume, low energy food that provides the feeling of satiety and fullness without the extra calories, often found in larger meals or less healthy, convenient snacks. Gourmet Tomato Soup can be enjoyed at anytime throughout the day as a healthy and nutritious snack. Mix 2½ tablespoons (32 g) with 200 ml of hot or cold water. When using the Herbalife spoon, use 2 large and 2 small levelled scoops. Use as part of a balanced and varied diet in line with a healthy lifestyle. A nice addition to Herbalife family.